An unsealed dock door may lead to slippery and dangerous conditions as well as lost energy. Gateway Iproducts Dock Seals will create a safe environment and regulate theft and security concerns due to an unsealed door. Dock Seals are foam pads that the trailer compresses into when it backs in and comes to rest against the dock bumpers, forming a seal around three sides of the trailer. Generally, dock seals provide a tight seal for a relatively low price, but they can become worn easily at loading docks that receive heavy traffic. Dock seals are best used when there is a minor variation in the size and style of trailers being served. It is the most advanced and most high-end dock seal. Adopt the PVC fabric material as the airbag. Inflatable dock shelter adapts accurately to various size of lorry or containers. It offers excellent sealing performance and prevents outdoor heat entering warehouse. 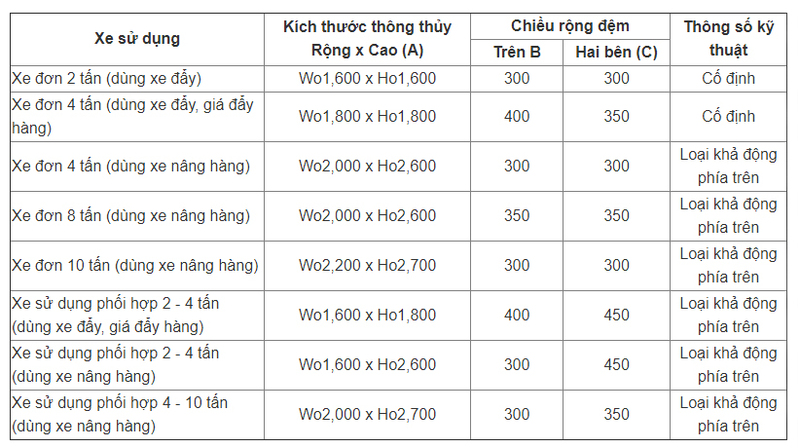 (*) Kích thước trên là kích thước tham khảo trong trường hợp mặt sàn cao hơn mặt đất 1,000m. (*) Kích cỡ của các xe trong cùng một loại có thể khác nhau nên trước khi điều chỉnh xe đưa vào sử dụng, hãy liên hệ với nhân viên kỹ thuật của chúng tôi để được tư vấn chính xác.